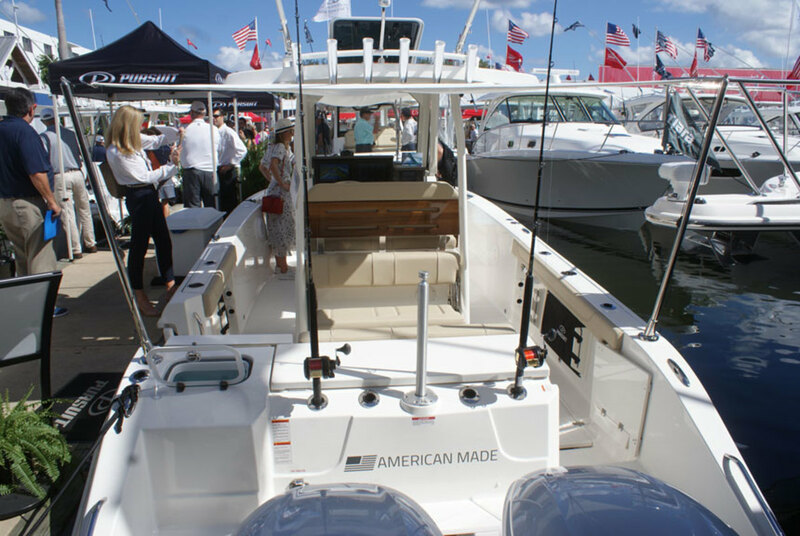 While the trend seems to be toward larger and larger center consoles, Pursuit Boats is displaying its new S 288 Sport at the Fort Lauderdale International Boat Show. The S 288 Sport is designed for fishing but also has family-friendly features. “We make the forward section of the boat more cruising-oriented,” Pursuit president Bruce Thompson told Trade Only Today. Among the amenities are bow lounges with stowage in the base, chaise-style seating on the forward side of the console and a cabin with a private head that includes a handheld shower. There’s seating for four abaft the helm station, and a hull-side door aft makes boarding or bringing in a fish easier. Fishing features include a live well and two in-deck fishboxes. Added Pursuit marketing manager David Glenn: “We are very active in presenting new models.” The company is finishing a new boat just about every quarter. Thompson said Malibu is helping Pursuit expand its headquarters and manufacturing facility in Fort Pierce, Fla. Pursuit has approximately 32 acres that hasn’t been developed, due in part to environmental regulations. With Malibu’s encouragement, Pursuit is considering donating some of that property for preservation and acquiring additional land for expansion. Thompson said the company also is developing an in-house training program. “We have a large Haitian contingent, and we work hard to take care of them,” he said.